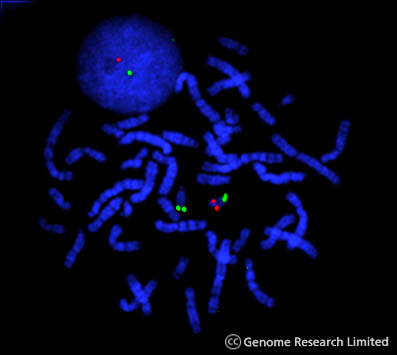 Deciphering Developmental Disorders (DDD) project - What is a genome? Every cell in your body has a complete set of instructions about how to make your cells and their components, and to direct how these interact. This set of instructions is your genome. Your genome is quite similar to everyone else's genome, which is why we all turn out to be human beings. But every other living thing also has a genome. You could think of the genome as a recipe book that carries all of the instructions to make a human being. Where does our genome come from? We actually have two genomes each. We get one copy from our mother and one from our father to make a fertilised egg containing two genomes with a set of instructions to make a new person. Your genome is made of a chemical called deoxyribonucleic acid or DNA. All living things have DNA packaged into their cells. In animals DNA is tightly packaged into bundles, wrapped around a scaffold of protein. If we look at DNA under a microscope, we can sometimes see these bundles of protein and DNA, called chromosomes. The amount of DNA and the number of chromosomes in an organism's cells depends on the species it comes from. Humans have 46 chromosomes (23 pairs). If you are thinking about the genome as a recipe book you could think of the chromosomes as chapters in the book. DNA's code is written in only four 'letters', called A, C, G and T. The meaning of this code lies in the sequence of the letters A, C, G and T in the same way that the meaning of a word lies in the sequence of alphabet letters. Your cells read the DNA sequence to make chemicals that your body needs. A gene is a functional region of DNA that contains the instructions to make a chemical in your body. The DNA in a gene usually codes for a protein. In our cells, proteins are the workforce; they get everything done. Proteins break down our food to release energy. Proteins organise the transport of useful chemicals between cells. Often, these useful chemicals are themselves proteins. Between generations or over a lifetime genomes change. These changes are called mutations. Mutations are happening in your cells all the time. They can happen spontaneously and at random. You can also inherit older mutations from your parents. This is why diseases can run in families. If a mutation happens in a part of the DNA that does not code for a protein or regulate when a gene is switched on or off, the chances are that the mutation will not even be noticed by the individual. However, some mutations can be detected because they lead to a change in the coding parts of a gene and result in a change to the protein structure or amount of protein produced. These relatively few mutations directly affect the ability of the protein to carry out its job or change the way the protein does its job. Mutations come in many different shapes and sizes: a single letter may be changed, a whole segment of DNA sequence may be flipped over and reverse itself, or huge sections of the genome could be duplicated or deleted. A few of these changes can be seen under a high-powered microscope but most require techniques that can compare the sequence or activity of specific DNA segments. This is where a single letter in the DNA sequence is changed. This is equivalent to a spelling error in a word of our genome recipe book. Small or large sections of DNA can be duplicated or deleted in different individuals. These duplications or deletions can have a dramatic effect on the health of an individual. For example people with Down's syndrome have an additional copy of chromosome 21 causing a condition with significant physical differences and learning difficulties. This is equivalent to a word, paragraph or even a whole chapter of our genome recipe book being repeated or deleted. Small or large sections of DNA can be can be reversed (an inversion) or swapped between different chromosomes (a translocation). For example, some forms of the blood disorder haemophilia are caused by short segments of the Factor VIII gene being inverted or reversed inside the gene. This is equivalent to a paragraph or pages of our genome recipe book being removed and pasted back in the wrong way (an inversion) or removed and pasted in a different chapter (a translocation). 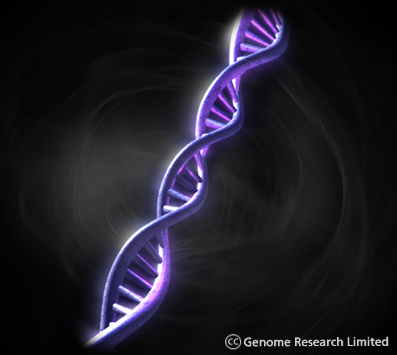 Mutations in DNA and their implications in human diseases have been known about for many years. However, recent studies looking at the entire genome have demonstrated that deletions, insertions or duplications of sections of DNA are more common than previously believed. Although most of the time these forms of mutation have no visible impact on an individual's health, in some people they have been found to be the cause of birth defects or developmental disorders.